The head of the Communist Party of Vietnam Central Committee’s Commission for External Relations, Hoang Binh Quan, met with a delegation of the Socialist Women’s Union of the Democratic People’s Republic of Korea (DPRK) in Hanoi on November 5. 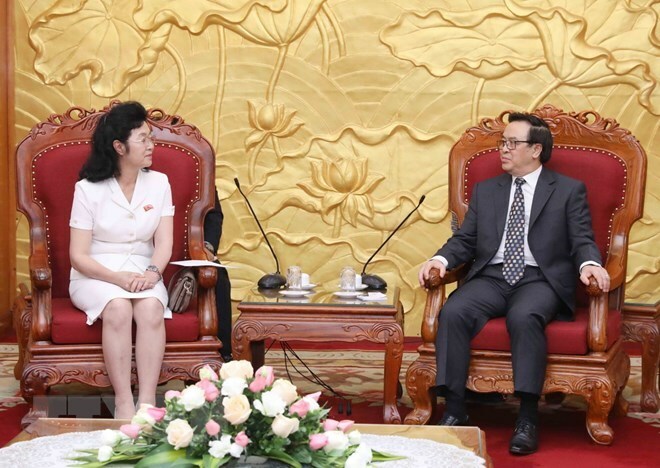 Applauding the DPRK delegation’s working visit, Quan affirmed that the Vietnamese Party, State, and people have always treasured and are looking to enhance its friendship and cooperation with fraternal countries, including the DPRK. He underlined the value of the traditional bilateral friendship and cooperation between Vietnam and the DPRK, which were nurtured by Presidents Ho Chi Minh and Kim Il-sung, and generations of leaders of the two nations. Quang also highlighted Vietnam’s support for a Korean Peninsula of peace, stability, and prosperous development, expressing his delight at the positive progress in this peninsula. At the meeting, the official also presented Vietnam’s achievements during its 30 years of reform, including substantial contributions by Vietnamese women and the Vietnam Women’s Union. Quan voiced his belief that the Party, State, and people of the DPRK will continue efforts to promote regional peace, as well as wishing the Socialist Women’s Union success in attaining new accomplishments. He asked the two women’s unions to devise further measures to increase experience sharing, especially in encouraging women’s engagement in socio-economic development. He also hoped they would develop stronger ties to contribute further to the relationship between the Vietnamese and DPRK people. For her part, Chairwoman of the Socialist Women’s Union Jang Chun-sil, who is also an alternate member of the DPRK’s Workers’ Party Central Committee, briefed the host official about her country’s development accomplishments in recent years, the activities of the Socialist Women’s Union, and the two unions’ cooperation.